There is not a lot more frustrating than waking up to discover that the moss and other saplings you planted the night before are all floating on the surface of your aquarium. Weighing them down is not always practical. And, tying them with string is so fiddly. 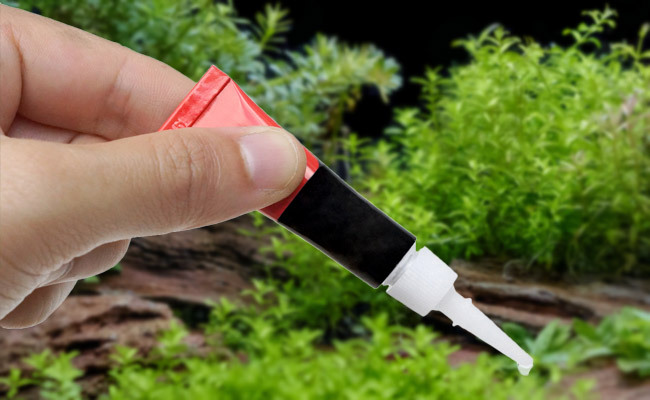 In fact, if you want to stick something to anything in your aquarium, glue is often the best way to go about it. But you need the right glue. One that you can easily apply, even wet. Forget reaching for a tube of silicone – it takes too darn long to set and is best used for sealing and repairing. And, don’t even think about buying one of those “special aquarium glues.” Not saying they don’t work, but they are much more expensive than they should be! Cyanoacrylate gel… Better known as super glue gel! I love that they come in a pack of 12 for one low price. And, considering that you can use this glue for more than just your aquarium, keeping spare tubes on hand always comes in handy. Affordable and effective, it’s all you’ll ever need. Well, it’s easy to dispense, holds tight and dries quickly – you know, all the stuff that you would expect from glue. You can use this glue under water! 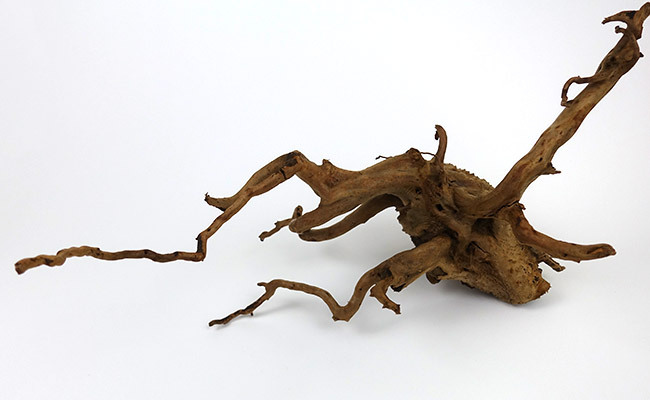 Have a piece of driftwood in your planted tank that you want to glue some plants to? Not a problem, you don’t even need to take it out of the tank. Airline tubing falling off the suction cups? No worries – underwater glue to the rescue! Moss floating up from your gravel? Stick it down! Glue decorations and ornaments to rocks or even rocks together. You get the idea, this stuff is darn handy – it’s basically an aquascaper’s best friend. And best of all, it’s harmless to your fish. Yep, 100% aquarium-safe. In fact, this is basically the same stuff that dedicated aquarium brands use as their glue – they just repackage the glue and market it to fish keepers. Chances are you have used super glue before. 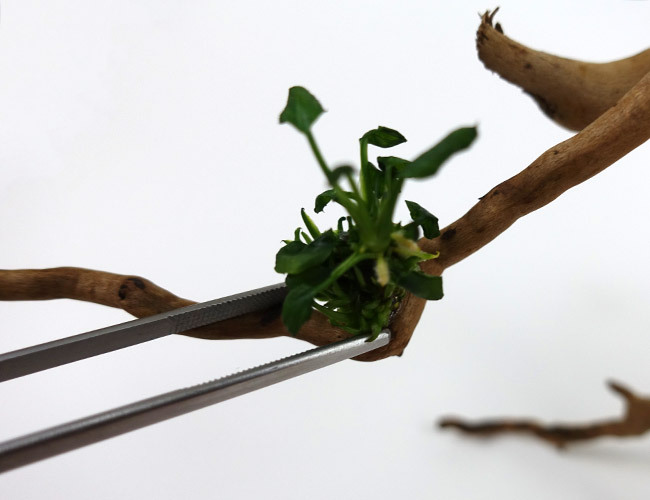 But just on the off chance you haven’t, I’m going to take you through gluing plants to a piece of driftwood. It’s a little plain, right? Okay, so the first thing I like to do is prepare the surface I am going to glue to. 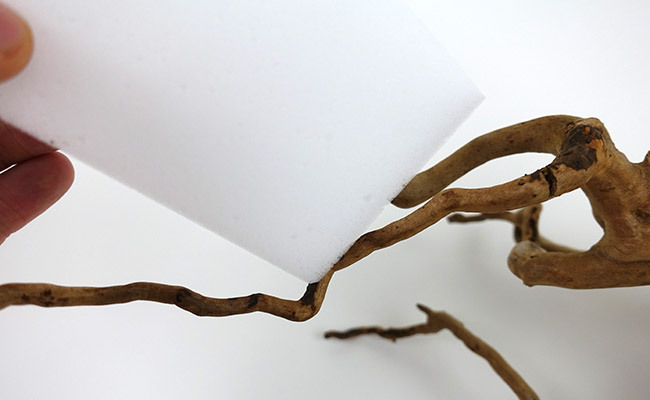 While this isn’t the most important step when used outside of water, I recommend it when you will place it under water – wipe away that layer of slime to give the glue the best chance of bonding. I personally use melamine foam. It’s cheap, can be cut into smaller pieces and can remove almost anything from anything. This is the same material used in those Mr. Clean Magic Erasers and are another awesome product you should always have on hand. I also use this foam to wipe down the aquarium glass for a sparkling finish and, just yesterday, I used it to effortlessly remove my nephew’s “artwork” that he drew on the walls… Great stuff! 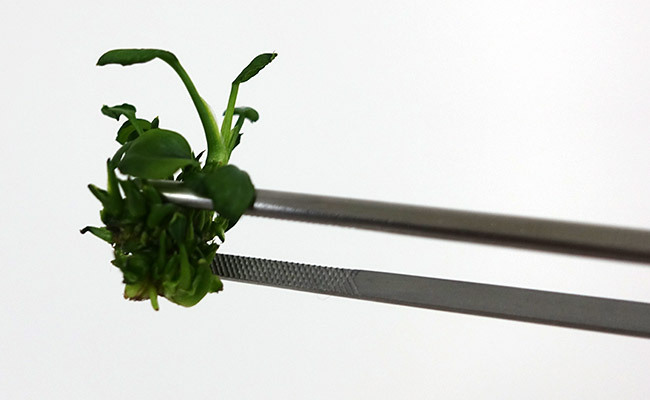 I am going to be using an anubias nangi sapling. 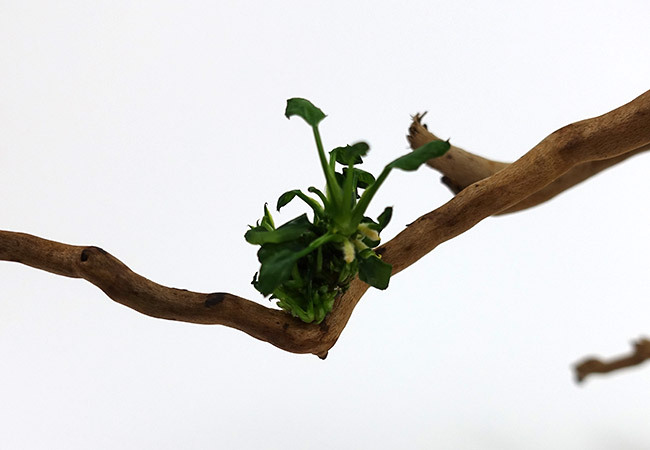 A great beginner plant that looks awesome on driftwood. It’s looking a little worse for wear now, but don’t worry! It will burst back to life once I get it back under water. But first, we have to glue this sucker into position. So, turn the plant over and apply a generous dollop of glue! Be quick, this stuff dries fast! You only need to hold it in place, applying pressure for a slow 5 count. 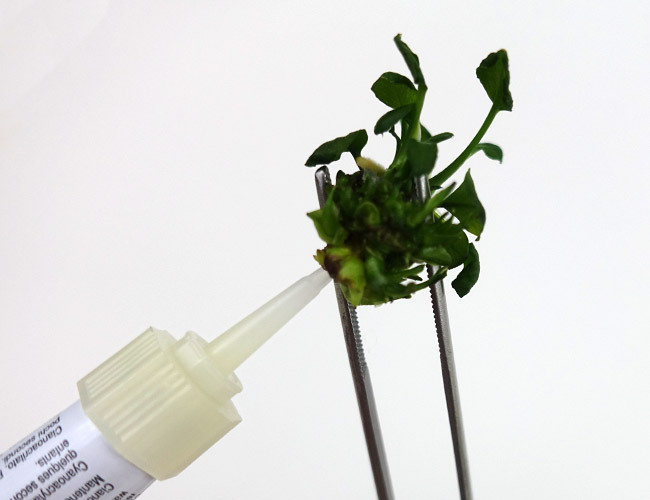 If you used enough glue, the glue should now support the plant without your help. Hooray! We did it… Pretty simple, huh? Now, all that’s left to do is to repeat until I have my driftwood covered in beautiful aquarium plants! Don’t forget to put the cap back on the glue when you are finished. You don’t want the glue drying out and going to waste. A word of warning, super glue gel dries white. And, it is very visible under water. This isn’t an issue at all for plants, which are just going to grow over it anyway, hiding it from view. But a messy glue job on anything else, like decorations, can be much more difficult to hide. But if you have a steady hand and are neat with the glue, you can make a bond that is practically invisible. One final thought before I leave you – be careful. This is super glue. This stuff is designed to stay stuck. Always read the directions before use. Do you use glue in your aquarium? Let me know in the comments below! is Dow corning GP silicone okay for pasting Thermocol cement pasted decoration?? I have no experience with Dow Corning GP Silicone. If it’s 100% silicone without additives like fungacides, then it might be okay. If in doubt, don’t add it to your tank. I have a small outdoor pond made with a pond liner. The liner has developed a small hole and although I patched it with a pond liner repair kit (and followed the instructions faithfully), it looks like the patch is coming loose on one side. Would this glue work for sealing the loose edge of the patch or would water safe silicone work better? My chorus frogs are not at all happy with this latest development! Thanks for your advice! I’m terribly sorry but my expertise only covers aquariums. I have no experience with ponds or liners. Your quite informative, glad I found your forum. Can you use glue from a hot glue gun?? It depends on the glue. If it has additives or mold inhibitors, then no. If in doubt, I wouldn’t use it. However, based on discussions I have had with other fish keepers, it doesn’t appear to hold anywhere near as well as Super Glue Gel, which in my opinion defeats the purpose of it being used as a glue. I’m so glad to have stumbled over this page! I bought my wife an aquarium and want to use Star Wars models from Bandai for the decoration. Now that the question for aquarium safe glue is answered, I was considering to paint and seal the models. However it seems to be very hard to find creditable information. I was thinking to use enemal or acrylic paint and seal it of with clear Plasti Dip as it was recommended on YouTube. Would you have any advise/ideas? As long as you seal it, it will be fine. I am unfamiliar with star wars models but you could use Krylon Fusion Clear Coat. Plasti-dip or an two-part epoxy resin would be my choice. The plastidip would be considerably easier to apply. Ordinarily, for glass dividers, silicone is used to hold them in place. However, these can be pressed against either side of the glass. I’m doubtful superglue would hold. I know that HMEF (hamburger matten Eck filters) use silicone to hold the L-shaped pvc frames against the corner of the tank, so I’d say silicone would likely be a better choice. I’m building a very large Aquatic Turtle tank for two 8″ aquatic turtles. The dimensions are 4’W x 5’L x 3’H (& 6 4″ 4×4 legs). The tank should hold 160 gallons of water with water level going halfway up the tank. I’m using sealed wood as the main construction. and I want to line the interior of the tank with a big sheet of 20mil LLDPE smooth clear vinyl. My question is: Can I use the SuperGlue Gel to bond the vinyl to the wood? or should I use Aquatic-safe Silicone? My goal is to keep the Thick vinyl sheet neatly and securely in place against all 5 sides (4 sides + bottom). (of course I will use lots of clamps during the curing process). That sounds like a very interesting project. I wish you much success in it’s construction. While my experience with bonding vinyl to wood is limited to an unrelated woodwork piece I created years ago, I am doubtful that super glue gel is the correct adhesive to use here. If my memory serves correctly I used some kind of cement adhesive. You would need to research further as to the exact adhesive that is both aquarium safe and suitable, you are creating a very unusual project – my aquarium experience is limited to glass tanks. Hello, I have a tube of super glue that contains ethyl and the aforementioned cyanoacrylate. Would this be safe to secure pieces of fake plant decor that has since fallen apart? Hi Fish Momma, Ethyl Cyanoacrlate is the full name, they are not two seperate ingredients. So yes, if this is the only ingredient then it is safe to use inside your aquarium. I really appreciate you sharing your expertise with us! I am committed to compassionate pet keeping, which means giving each of my pets the most fulfilling, natural, non-stressful environment I can provide. Now that’s a mindset I can get behind. Your pets are very lucky to have an owner like you. Can using to much gel super glue make fish sick? Anecdotally, I have used two whole tubes in a mammoth gluing session and saw no problems with my fish, shrimp or water parameters. I have a piece of drifwood that i dropped an the a piece of it broke off. What glue could I use to glue it? 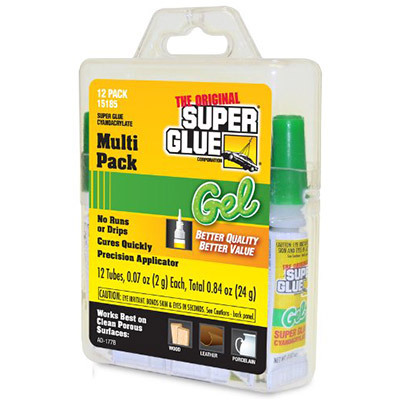 You can use the same glue that is listed in this guide. Make sure you are neat, the glue will dry white – but it will hold strong! Do you mean the normal Super Glue which can be found in any supermarket or Store? Isn’t it harmful for the fish? If the super glue in your local store is Cyanoacrylate gel, which is usually a combination of silica and Cyanoacrylate. This can be used in your aquarium. If it makes no mention of Cyanoacrylate then I would be hesitant to use it in your tank. You are correct. this glue works good. It has hold my plants down for a long time now. I think I bought too many though. I don’t need that much glue. Thanks for your feedback. Yep, this glue is good stuff for when you want something stuck in a hurry. Hold on to that glue, you might not have a use for it now but I’m sure it will come in handy in the future. I sounds like once I glue something in to the aquarium, it’s forever. I want to glue something to the glass but I don’t want it to be white and I don’t want it to be permanent. I guess super glue is not for me. Why not try an aquarium safe silicone instead? Silicone is easily removable with a razor. If you have a glass tank, it’s the same stuff that is bonding the glass together. It’s still going to be visible, but it won’t be white and can easily be removed. Does it have to be the gel, or will the thin liquid work too? If the only ingredient is Cyanoacrylate then it’s safe.